Like an elegant Queen, she sits quietly on her throne, undisturbed by the world around her. She’s strong. Determined. Clear on her intent. Wind. Rain. Sun. Thunder. She stays still through it all. She’s a mother protecting new life. For a few weeks now I’ve been watching a Mute Swan as she sits on an island near our home. She’s perched on her nest waiting for eggs to hatch and each time I drive by, I say a silent prayer that all goes well. I don’t have children, but if I did, I have no doubt I’d be just as committed and fierce with my love. In this lifetime, I made a choice to be a different kind of mother, a woman learning to care for her soul and sharing her lessons with others. And while the decision to forgo parenting this time around was made consciously, the grief still visits on days like today. 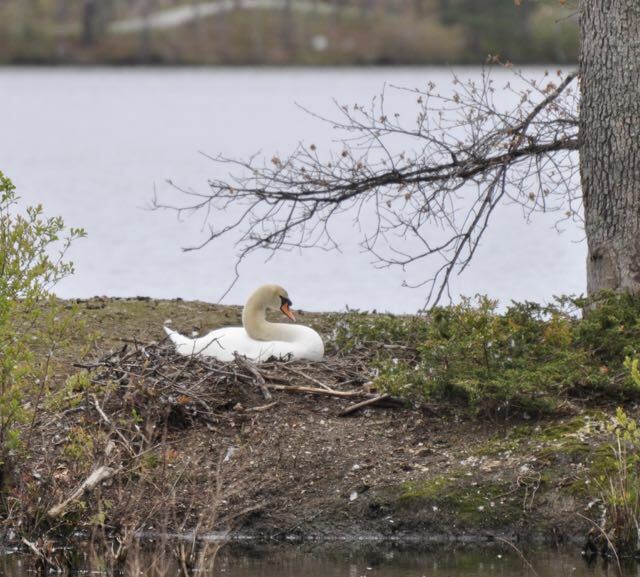 Yesterday, while driving home from the grocery store, I felt compelled to visit the swan. I wanted to check in on her, drink in her beauty from a distance, invite the healing energy of nature to seep into my bones. Like today. It’s time to put the final touches on my next book so it can be shipped off in the morning, and I’ve been ignoring the manuscript all day. I walk around it. Glance in its direction and look away. Find more important things to do like file my nails, empty the dishwasher, or clean out the trunk of my car. I laugh at myself. Watch as I circle my own nest, afraid to sit and finish the birthing process. I try to pretend it doesn’t matter, but the truth is, it does. There’s no turning back once this step is complete. Effortless creativity. Sensitive mystic. Elegant power. The swan represents heightened creativity. In Hindu mythology, the goddess Saraswati (the embodiment of language, creativity, and artistry) rides on the back of this graceful creature. The swan is ready to take us there – to the fluid realm of writing, creating, and reflecting. Wow. Pretty straightforward wouldn’t you say? Happy Mother’s Day to you, and to my mom, Ann Richardson, a woman as graceful as a swan, and to my mother-in-law, Pat Gerrish, another woman I adore. By the way, my new book is called “Waking Up in Winter: In Search of What Really Matters at Midlife,”a memoir in journal form, and it will be released on December 19th, just in time for the holidays. This week’s video shows how much babies trust their moms . You can watch it, here.